When it’s time to refinish a bathroom, leave the plain ceramic tiles behind and go with something magnificent. You cannot go wrong with the incredible colors and earthy tones found in natural marble stones. You may be worried about the cost, but there are ways to keep your expenses down while giving your bathroom a luxurious look and feel. The first thing you’ll have to do is find the right marble for your new space. This doesn’t have to be an overwhelming decision. Here are a few issues you might consider before you choose the final color. A general rule of thumb to remember is that deeper shades will make a large area feel cozy while lighter colors visually expand those smaller rooms. This isn’t to say that you cannot use deep tan Adalia Cappuccino marble in a small bathroom, but you should take a moment to consider what you’re trying to achieve. If a bathroom feels cavernous to you, then the darker colors in Rojo Alicante can help make the space feel more cozy and less empty. However, if you’re working with a tiny bathroom that’s already limited in floor space, then brilliant white Bianco Dolomiti tiles may be the best way to open it up and make it feel bigger. Are you going for a luxurious feel or something more casual? Tread carefully as you choose your colors and start creating patterns. Adalia Cappuccino has a wonderful, relaxed pattern that makes it perfect for almost any residential setting. The soft cream, brown, and dark yellow veining give it some movement that can add interest to any dull space. However, Vanilla Oro has a more sophisticated look with its brilliant white color and overall lack of veining. This is why it’s one of the top choices for fine hotels and other five-star establishments. If you’re trying to create that same look at home, then this white marble is absolutely the right choice for you. Perhaps you’re considering something that’s more versatile and can be changed depending on your mood and the time of year. In this case, your best bet may be to invest in the Vanilla Oro tile for the basic construction. You can then introduce a more relaxed feel by choosing casual rugs, towels, and other accent pieces. If you want to add a pattern to your bathroom, start by drawing it out on graph paper and filling in the colors you’ll use with colored pencils. There are countless borders and patterns that you can create by mixing contrasting and coordinating tiles. Borders that are a foot or two away from the wall can help make a large space feel more welcoming. You can also use a medallion in the center to add interest to a smaller room while maintaining a spacious feeling. When you’re developing the pattern, be sure to include the baseboards and bathtub apron in your final plan. Will you carry the tile onto these vertical surfaces or go with something different? This will play into the overall pattern, so you may want to make these decisions ahead of time. If you’re not sure about a certain pattern, then consider buying a few tiles and setting a few pieces in place over your existing flooring. Take care not to walk on these tiles or you may damage them. However, you can then spend a few days looking at the pattern to be sure that it’s what you really want in the space. Another consideration is the rest of your home. While the bathroom is a separate room, it should still blend and flow with other areas. If your home has a decidedly modern theme, then a traditional bathroom with Adalia Cappuccino tiles on the shower walls may feel out of place. Cool Crema River may be a better choice for maintaining that modern feeling while still introducing the veining and color movement that you love. 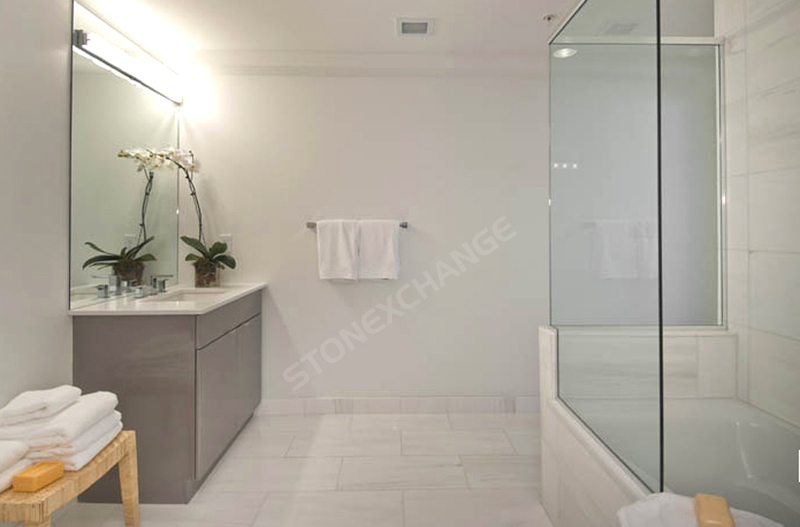 The rooms that connect directly to the bathroom, such as any closets or bedrooms, are particularly important when you’re choosing the right tile for this project. While it’s not much fun to choose marble based on your budget, it is necessary if you want to stay on track financially. While you may love the brilliant colors of Vanilla Oro and Bianco Dolomiti, the higher price-per-square may not fit with your limits. However, you can usually find an acceptable alternative that will give you the look while taking it easy on your pocketbook. Crema Marfil Marble features a lovely white to cream color that’s highly consistent with minimal veining, and it can be the perfect choice for all types of bathrooms. The cost is substantially lower, but the stones are every bit as durable. Another option is to limit your use of the more expensive stones to an inset area in the floor or one wall in the shower. When you get a little creative with the plan, you may find that it’s easy to incorporate the tiles you love while keeping the budget in line with expectations. When it’s time to order new tiles for your project, look beyond the local big box store and give Nalboor a chance to serve you. We own our quarries and manufacturing centers overseas, and that allows us to maintain tight cost and quality control standards throughout the manufacturing and delivering process. While other suppliers are dealing with several markups, we’re offering wholesale pricing on superior tiles that are beautifully matched and perfect for your upcoming project. We offer prompt shipments, and we take great care to minimize breakage when your tiles are being shipped. Our Miami distribution center stocks the most popular colors and sizes, and we’re also happy to offer custom orders if you need specific sizes or cuts. Customer satisfaction is our top priority, and we hope that you’ll be pleased with our service. Contact us today to discuss your needs and place an order.